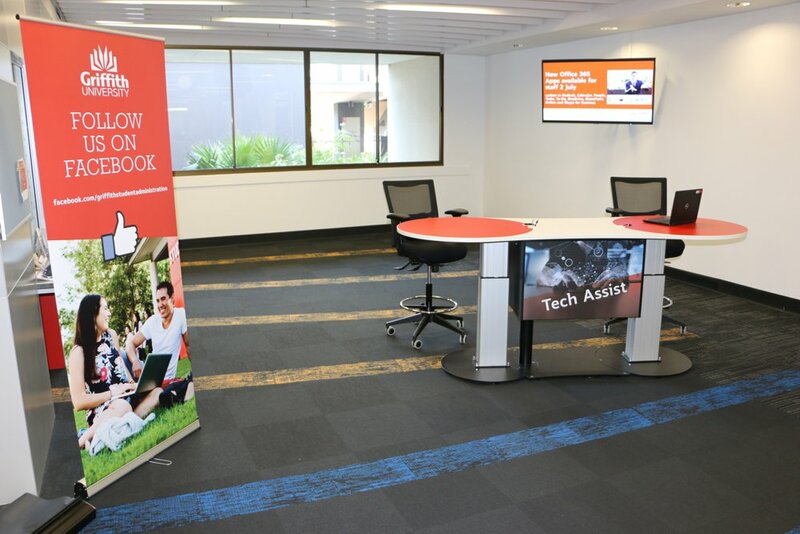 Griffith University provides a thriving network of learning and innovation across five campuses in South East Queensland. The university prides itself on the ‘remarkable’, challenging convention and adapting and innovating, to create bold new trends. 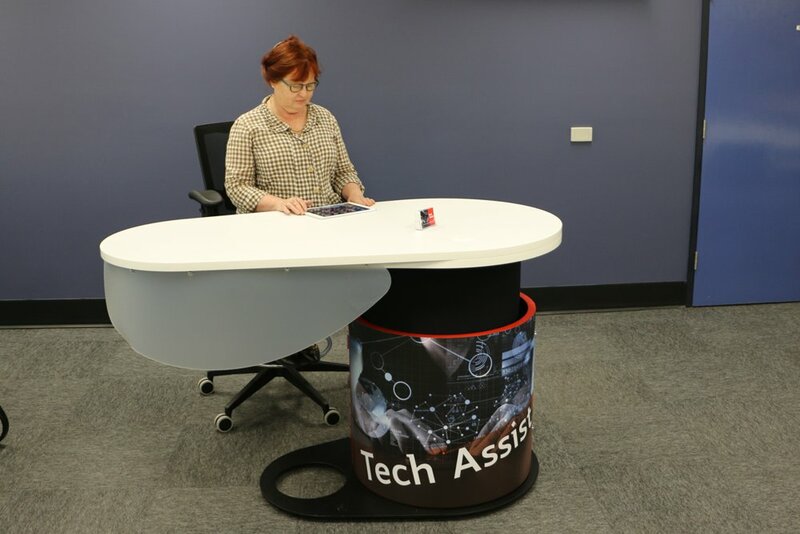 Instinct Furniture’s stream-lined, height adjust YAKETY YAKs, were the perfect partner to deliver IT support throughout Griffith’s five campus libraries. Four YAKETY YAK 1500s were fitted with an angle-wing courtesy screen, and the university arranged for the barrels to be finished with a striking graphic. The clean and functional lines of YAKETY YAK are mirrored with the minimal use of equipment by IT staff, with services successfully being delivered using laptops and tablets. Unencumbered YAKETY YAK 1500, in the standing position, fitted with an opal courtesy screen and ‘Tech Assist’ graphic on the barrel, at Logan Campus. 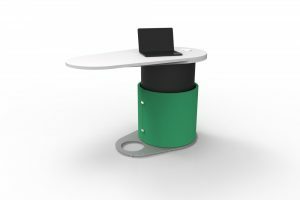 IT Staff can choose to work seated or standing and the tapered worktop provides the ideal place to facilitate the sharing of information. The manoeuvrability of the pods allows them to be positioned in locations where help is needed the most. At the touch of a button, YAKETY YAK 1500 is adjusted to the seated position, at Logan Campus. 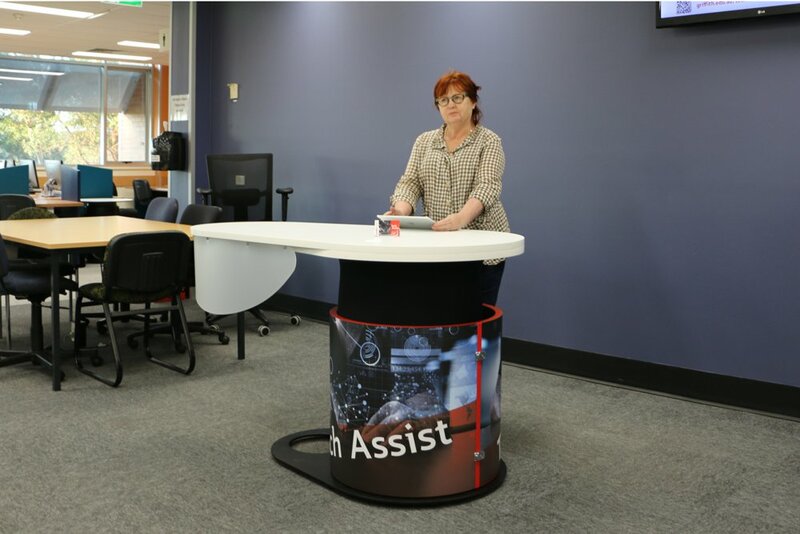 At Nathan Campus, YAKETY YAK 2400 Service Island was selected to support two staff members working independently on its dual desktop. The two striking meeting ends are naturally inviting — providing a place for the staff member and student to get alongside and interact. 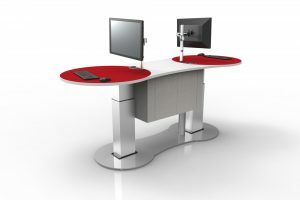 YAKETY YAK 2400 with its dual desktop, allows two staff members to work independently, at Nathan Campus.